The drone payload market is estimated to be valued at USD 3.63 billion in 2016 and is projected to reach USD 7.72 billion by 2021, at a CAGR of 16.25% between 2016 and 2021. The base year considered for the study is 2015 and the forecast period is from 2016 to 2021. To define, describe, and forecast the Drone payload market on the basis of type, end user, and region. To analyze the demand-side and supply-side indicators influencing the Drone payload market and provide a factor analysis for the same-side. To forecast the size of various segments of the Drone payload market in North America, Europe, Asia-Pacific, the Middle East, and the Rest of the World (RoW). The report also covers competitive developments, such as long-term contracts, joint ventures, mergers, new product launches and developments, and research & development activities in the drone payload market, in addition to business and corporate strategies adopted by key market players. 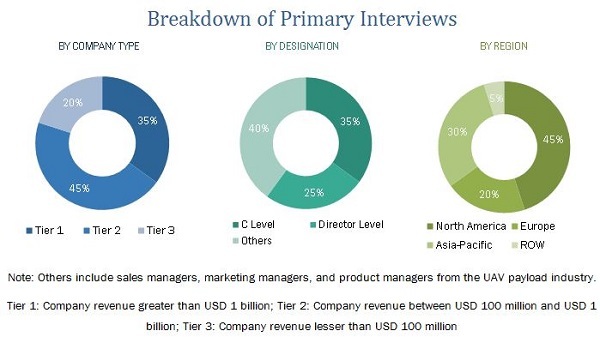 The ecosystem of the drone payload market comprises type and end-user industries. Various drone payload solution providers, such as Lockheed Martin Corporation (U.S.), AeroVironment, Inc. (U.S.), Elbit Systems Ltd. (Israel), BAE Systems (U.K.) and Northrop Grumman Corporation (U.S.), offer advanced technology systems, products, and services. They also provide a broad range of management, engineering, technical, payload, and information services. The commercial application is estimated to lead the global Drone payload market in the next ten years. This application is expected to grow four to five times faster than the military. Various companies are showing interest in the development of various innovative applications of UAVs. Amazon (U.S.) has planned to make use of UAVs in delivering products. Such innovations are driving the growth of commercial applications of UAVs. There have been huge R&D investments in UAV applications, such as mining, survey, 3D mapping, and oil & gas, among others. 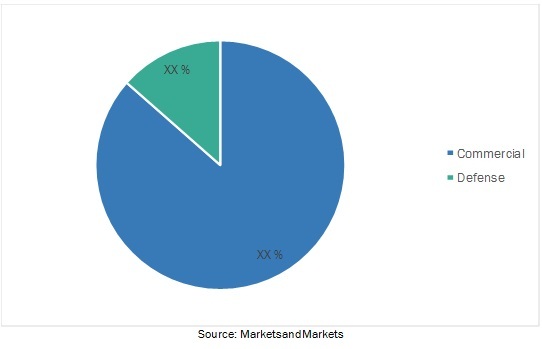 How will the Drone Payload Market drivers, restraints and future opportunities affect the market dynamics and subsequent market analysis of the associated trends? What are the key sustainability strategies adopted by Drone Payload Market players? What are the major technologies that are going to impact the market in future? Who are the key competitors and their growth strategy? What is the market share of countries in various sub-segments? How companies are adapting to change in demand of Drone Payload? 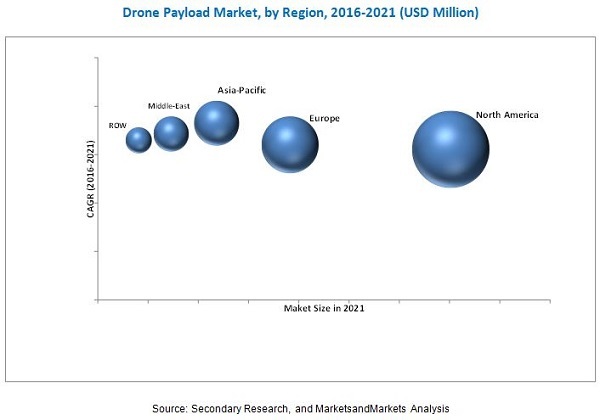 The drone payload market is estimated to be valued at USD 3.63 billion in 2016, and is projected to reach USD 7.72 billion by 2021, at a CAGR of 16.25% during the forecast period. Rapid advancement in technology is driving the drone payload market. Various technological advancements, such as micro-miniaturization, along with innovative use of micro electro mechanical devices (MEMS) and integrated computer application chips (ASIC) are expected to not only reduce the size and weight of sensors, but also enable their functional integration to fuse multiple data sources. Drone payloads comprise EO/IR, cameras, synthetic aperture radar (SAR), signal intelligence (SIGINT), electronic intelligence (ELINT), communication intelligence (COMINT), maritime patrol radar (MPR), and laser sensors, among others. The selection of these components which are mounted on a UAV is done based on the mission requirements. Drone payloads are increasingly being deployed to support multiple missions, which include target acquisition and battle damage assessment apart from ISR and border security missions, as well as wide area surveillance for offensive and defensive roles. On the basis of end user, the drone payload market has been segmented into defense and commercial. The defense segment dominates the market in terms of market size and is expected to continue its dominance during the forecast period. The commercial segment of the drone payload market, by end user, is projected to grow at the highest CAGR during the forecast period. The APAC region is anticipated to grow at the highest rate in the drone payload market during the forecast period. This market growth in the Asia-Pacific region can be attributed to increased military spending on drone payloads in countries, such as India and China. In addition to increasing requirements for military UAVs in both the nations, their civilian markets are expected to continue growing. Countries, such as Japan, South Korea, and Indonesia are taking several initiatives to encourage research and domestic production of UAVs. The growth rate of the drone payload market in North America and Europe is expected to be considerably low during the forecast period owing to fall in demand for drone payloads in these regions. Furthermore, advancement in the sensor technology may also restrain the growth of the drone payload market in these regions. The drone payload market is a diversified and competitive market with the presence of a large number of players. 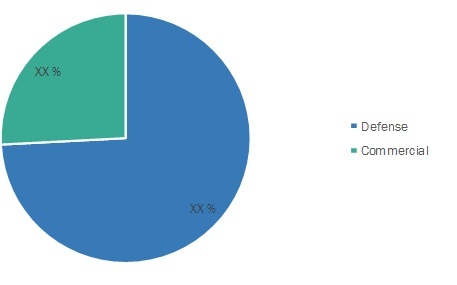 Key players in this market are Lockheed Martin Corporation (U.S.), AeroVironment, Inc. (U.S.), Elbit Systems Ltd. (Israel), BAE Systems (U.K.), and Northrop Grumman Corporation (U.S.). Lockheed Martin Corporation is an eminent player in the drone payload market. This dominance of the company can be attributed to its ability to develop and market innovative products and services that meet customer requirements. UAVs can deliver rapid and persistent elevated situational awareness and actionable intelligence with high manpower and cost efficiency. This is due to their ability to provide cost-effective C4ISR support similar to a low-flying satellite system. However, they are cheaper to launch and operate, lending situational awareness to other air and ground support personnel, and are ideal when rapid deployment and monitoring may be required in harsh terrains. The development of increasingly sophisticated sensors and cameras has greatly enhanced the capability of drones used for defense applications. Furthermore, there has been a move by several defense departments such as the U.S. DOD to reduce mission costs by flying more unmanned aerial vehicles rather than manned aircraft which entail a higher cost and risk. This is expected to bolster the demand for Drone payloads as their deployment increases in defense applications. Drone payloads used for defense applications have lesser procurement and operational costs compared to a manned aircraft. They are being accepted widely by defense departments around the globe due to the benefits they provide to armed forces. The upcoming technologies have matured as significant enablers for unmanned missions (for example, GPS). The unmanned systems have extreme endurance owing to which they can be used for high altitude flights. They also lower the operating cost and increase sortie rates. UAVs are being employed in the defense for intelligence, surveillance, and reconnaissance (ISR), electronic warfare, and strike missions. Cargo delivery, combat search and rescue, aerial refueling, and air combat are some of the upcoming applications of UAVs in defense. Changing warfare techniques require conducting search and destroying missions in populated areas and the availability of advanced navigation and satellite communication technologies have made remote operations of UAV more viable. The Drone payload market has not only stirred the interest of the defense organizations, but has also led to a number of investments from various public and private sector organizations. The capability of UAVs to provide a wide range of platforms for potential applications in the civil and commercial sector has led to enormous developments in using UAVs to aid civilians. UAVs offer attractive platforms for a broad range of potential applications in the civil and commercial sector, which are quickly navigating towards these applications. The commercial application is estimated to lead the global Drone payload market in the next ten years. This application is expected to grow four to five times faster than the military. Various companies are showing interest in the development of various innovative applications of UAVs.